Abdollahi, A., Shoar, S., Sheikhbahaei, S., Jafari, S. (2013). Sero-prevelance of Cytomegalovirus and Toxoplasma Infections among Newly Diagnosed HIV Patients in Iran; Assessing the Correlation with CD4+ Cell Counts. Iranian Journal of Pathology, 8(2), 81-88. Alireza Abdollahi; Saeed Shoar; Sara Sheikhbahaei; Siroos Jafari. "Sero-prevelance of Cytomegalovirus and Toxoplasma Infections among Newly Diagnosed HIV Patients in Iran; Assessing the Correlation with CD4+ Cell Counts". 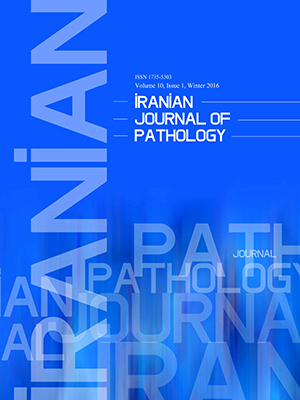 Iranian Journal of Pathology, 8, 2, 2013, 81-88. Abdollahi, A., Shoar, S., Sheikhbahaei, S., Jafari, S. (2013). 'Sero-prevelance of Cytomegalovirus and Toxoplasma Infections among Newly Diagnosed HIV Patients in Iran; Assessing the Correlation with CD4+ Cell Counts', Iranian Journal of Pathology, 8(2), pp. 81-88. Abdollahi, A., Shoar, S., Sheikhbahaei, S., Jafari, S. Sero-prevelance of Cytomegalovirus and Toxoplasma Infections among Newly Diagnosed HIV Patients in Iran; Assessing the Correlation with CD4+ Cell Counts. Iranian Journal of Pathology, 2013; 8(2): 81-88. Background and Objective: Opportunistic infections are the leading cause of death among patients subjected to the human immunodeficiency virus (HIV) infection and acquired immune deficiency syndrome (AIDS). The aim of this study was to compare the seroprevalence of Cytomegalovirus (CMV) and toxoplasmosis infection in newly diagnosed HIV infected patients with healthy controls and it’s correlation with CD4+ cell counts (CD4+). Materials and Methods: A case controlled study was carried out to investigate CMV and toxoplasmosis serology among newly diagnosed HIV infected patients referred to University affiliated hospital in Tehran and compared them to healthy subjects as control. A total of 100 HIV positive patients and 100 healthy controls were recruited. Clinical characteristics and CD4+ cell counts were evaluated. The statistical package SPSS 17 for windows was used for analysis. Results: Patients with HIV infection had a significantly higher positive serology for CMV than healthy controls (100% vs. 93% P<0.05). There was no significant difference between HIV positive and HIV negative patients in terms of toxoplasmosis serology. There was no significant difference between males and females with respect to CMV or toxoplasmosis serology. Conclusion: CMV and toxoplasmosis infection are highly prevalent among HIV infected patients and also healthy controls, with a higher seropositive rate of CMV in HIV cases. Saha K, Firdaus R, Santra P, Pal J, Roy A, Bhattacharya MK, et al. Recent pattern of Co infection amongst HIV seropositive individuals in tertiary care hospital, Kolkata. Virol J 2011;8:116. Meyer CN, Skinhoj P, Prag J. Bacteremia in HIV-positive and AIDS patients: Incidence, species distribution, risk-factors. Outcome, and influence of long-term prophylactic antibiotic treatment. Scand J Infect Dis 1994;26(6):635-42. 1993 revised classification system for HIV infection and expanded surveillance case definition for AIDS among adolescents and adults. MMWR Recomm Rep 1992;41(RR-17):1-19. Griffiths PD. CMV as a cofactor enhancing progression of AIDS. J Clin Virol 2006;35(4):489-92. Okome-Nkoumou M, Boguikouma JB, Kombila M. Opportunistic diseases in HIV-infected patients at the Jeanne Ebori Foundation in Libreville, Gabon . Med Trop (Mars) 2006;66(2):167-71. Ouermi D, Simpore J, Belem AM, Sanou DS, Karou DS, Ilboudo D, et al. Co-infection of Toxoplasma gondii with HBV in HIV-infected and uninfected pregnant women in Burkina Faso. Pak J Biol Sci 2009;12(17):1188-93. Kedhar SR, Jabs DA. Cytomegalovirus retinitis in the era of highly active antiretroviral therapy. Herpes 2007;14(3):66-71. Kelesidis T, Tozzi S, Mitty R, Worthington M, Fleisher J. Cytomegalovirus pseudotumor of the duodenum in a patient with AIDS: an unrecognized and potentially treatable clinical entity. Int J Infect Dis 2009; 14(4): 274-82. Fuse S, Molloy MJ, Usherwood EJ. Immune responses against persistent viral infections: Possible avenues for immunotherapeutic interventions. Crit Rev Immunol 2008;28(2):159-83. Chakravarti A, Kashyap B, Matlani M. Cytomegalovirus infection: An Indian perspective. Indian J Med Microbiol 2009;27(1):3-11. Alfonso Y, Fraga J, Fonseca C, Jimenez N, Pinillos T, Dorta-Contreras AJ, et al. Molecular diagnosis of Toxoplasma gondii infection in cerebrospinal fluid from AIDS patients. Cerebrospinal Fluid Res 2009;6:2. Murata M, Furusyo N, Otaguro S, Nabeshima S, Ariyama I, Hayashi J. HIV infection with concomitant cerebral toxoplasmosis and disseminated histoplasmosis in a 45-year-old man. J Infect Chemother 2007;13(1):51-5. Nissapatorn V. Lessons learned about opportunistic infections in southeast Asia. Southeast Asian J Trop Med Public Health 2008;39(4):625-41. Gona P, Van Dyke RB, Williams PL, Dankner WM, Chernoff MC, Nachman SA, et al. Incidence of opportunistic and other infections in HIV-infected children in the HAART era. JAMA 2006;296(3):292-300. Verbraak FD, Boom R, Wertheim-van Dillen PM, van den Horn GJ, Kijlstra A, de Smet MD. Influence of highly active antiretroviral therapy on the development of CMV disease in HIV positive patients at high risk for CMV disease. Br J Ophthalmol 1999;83(10):1186-9. Leport C, Derouin F, Morlat P, Chene G, Vilde JL. Toxoplasmosis in immunosuppressed patients. Contribution to the knowledge of toxoplasmic infection. Med Mal Infect 1996;3:437-40. Centers for Disease Control and Prevention. (2010). CMV. Retrieved from http://www.cdc.gov/cmv/clinical/lab-tests.html. Mocroft A, Sabin CA, Youle M, Madge S, Tyrer M, Devereux H, et al. Changes in AIDS-defining illnesses in a London Clinic, 1987-1998. J Acquir Immune Defic Syndr 1999;21(5):401-7. Salmon-Ceron D, Mazeron MC, Chaput S, Boukli N, Senechal B, Houhou N, et al. Plasma cytomegalovirus DNA, pp65 antigenaemia and a low CD4 cell count remain risk factors for cytomegalovirus disease in patients receiving highly active antiretroviral therapy. AIDS 2000;14(8):1041-9. Deayton JR, Prof Sabin CA, Johnson MA, Emery VC, Wilson P, Griffiths PD. Importance of cytomegalovirus viraemia in risk of disease progression and death in HIV-infected patients receiving highly active antiretroviral therapy. Lancet 2004;363(9427):2116-21. Adjei AA, Armah HB, Gbagbo F, Boamah I, Adu-Gyamfi C, Asare I. Seroprevalence of HHV-8, CMV, and EBV among the general population in Ghana, West Africa. BMC Infectious Diseases 2008;8. Kalugina MI, Orlova OA, Rybalkina TN, Karazhas NV. The rate of human herpes virus type 6 and cytomegalovirus among HIV-infected and healthy women from Chelyabinsk and Moscow. Zhurnal mikrobiologii, epidemiologii, i immunobiologii 2007(3):81-3. Micol R, Buchy P, Guerrier G, Duong V, Ferradini L, Dousset JP, et al. Prevalence, risk factors, and impact on outcome of cytomegalovirus replication in serum of Cambodian HIV-infected patients (2004-2007). Journal of Acquired Immune Deficiency Syndromes 2009;51(4):486-91. Spector SA, McKinley GF, Lalezari JP, Samo T, Andruczk R, Follansbee S, et al. Oral ganciclovir for the prevention of cytomegalovirus disease in persons with AIDS. Roche Cooperative Oral Ganciclovir Study Group. N Engl J Med 1996;334(23):1491-7. Falusi O, French AL, Seaberg EC, Tien PC, Watts DH, Minkoff H, et al. Prevalence and predictors of Toxoplasma seropositivity in women with and at risk for human immunodeficiency virus infection. Clin Infect Dis 2002;35(11):1414-7. Kodym P, Hrda S, Machala L, Rozsypal H, Stankova M, Maly M. Prevalence and incidence of Toxoplasma infection in HIV-positive patients in the Czech Republic. J Eukaryot Microbiol 2006;53 Suppl 1:S160-1. Meisheri YV, Mehta S, Patel U. A prospective study of seroprevalence of toxoplasmosis in general population, and in HIV/AIDS patients in Bombay, India. J Postgrad Med 1997;43(4):93-7. NCCLS. Clinical Use and Intrepretation of Serologic Tests for Toxoplasma gondii; Approved Guideline. NCCLS document M36-A [ISBN 1-56238-523-2]. NCCLS, 940 West Valley Road, Suite 1400, Wayne, PA 19087-1898 USA, 2004. Jeannel D, Niel G, Costagliola D, Danis M, Traore BM, Gentilini M. Epidemiology of toxoplasmosis among pregnant women in the Paris area. Int J Epidemiol 1988 ; 17(3):595-602. Spalding SM, Amendoeira MR, Klein CH, Ribeiro LC. Serological screening and toxoplasmosis exposure factors among pregnant women in South of Brazil. Rev Soc Bras Med Trop 2005; 38:173–7. Salahi-Moghaddam A, Hafizi A. A serological study on Toxoplasma gondii infection among people in south of Tehran, Iran. Korean J Parasitol 2009;47(1):61-3. Xiao Y, Yin J, Jiang N, Xiang M, Hao L, Lu H, et al. Seroepidemiology of human Toxoplasma gondii infection in China. BMC Infect Dis 2010; 10:4. Daryani A, Sharif M, Meigouni M. Seroprevalence of IgG and IgM anti-Toxoplasma antibodies in HIV/AIDS patients, northern Iran. Asian Pac J Trop Med 2011; 4(4):271-4. Fallah M, Rabiee S, Matini M, Taherkhani H. Seroepidemiology of toxoplasmosis in primigravida women in Hamadan, Islamic Republic of Iran, 2004. East Mediterr Health J 2008;14(1):163-71. Mohraz M, Mehrkhani F, Jam S, SeyedAlinaghi S, Sabzvari D, Fattahi F, et al. Seroprevalence of toxoplasmosis in HIV(+)/AIDS patients in Iran. Acta Med Iran 2011;49(4):213. Mostafavi SN, Ataei B, Nokhodian Z, Yaran M, Babak A.Seroepidemiology of Toxoplasma gondii infection in Isfahan province, central Iran: A population based study. J Res Med Sci 2011; 16(4):496-501. Richards FO Jr, Kovacs JA, Luft BJ. Preventing toxoplasmic encephalitis in persons infected with human immunodeficiency virus. Clin Infect Dis 1995 Suppl (1):49-56.